Shred Wise Inc. is the best source for local mobile shredding services in Brea, California. Our family-owned and -operated business has thousands of satisfied residential and commercial customers across Orange County and almost a decade of experience. We follow the industry’s best practices and standards set forth by NAID (National Association for Information Destruction) and are extremely knowledgeable in how document destruction helps our Brea clients avoid identity theft and data breaches. Moreover, we offer superior service at a cost-effective price. With Shred Wise Inc. as your shredding company of choice, you’ll gain peace of mind knowing that your sensitive information is being properly handled. We use a state-of-the-art mobile shredding truck, employ a limited number of carefully screened staff, and follow the industry’s best practices for document destruction. We are compliant with HIPAA, FACTA, GLBA, and other local and federal privacy laws, and frequently help commercial clients in Brea become compliant with these laws. Our safe and secure document destruction services are also affordable and flexible (available for one-time purges as well as ongoing scheduled service), making it possible for us to meet the needs of the individual as well as businesses of any size. Call us today to learn more. We can answer any questions; provide you with a quote over the phone; or schedule a visit to your home or business in Brea. We can usually accommodate last-minute or same-day purge requests, and can issue a Certificate of Destruction as soon as the job is done. For those interested in recurring service, we offer one of the simplest agreements offered by any shredding company serving the Brea area. This agreement states that the free locked bins and consoles we provide you with are yours only for the duration of service, and that you’ll provide us with 30 days’ notice if you wish to discontinue our services. That’s it–no hidden fees, no long-term contracts, and no complicated language. Shred Wise Inc. routinely works with business in Brea of every size and from every industry. We provide them with both one-time and ongoing shredding services and help them comply with both local and federal privacy laws. Our services are easily customizable and less expensive than trying to do it all in house. We welcome requests for one-time document purges as well as ongoing service on a weekly, biweekly, monthly, or bimonthly basis. Most of our shredding services are done on site, where our clients can easily witness the paper destruction process, but we also provide secure off-site shredding. With all of our services, we utilize a state-of-the-art mobile shredder, lockable containers, and carefully screened staff. To set up commercial shredding service for your Brea company, call today. You’ll work with a knowledgeable document destruction expert who will listen to your needs, provide service with a smile, and develop a cost-effective solution to meet them. 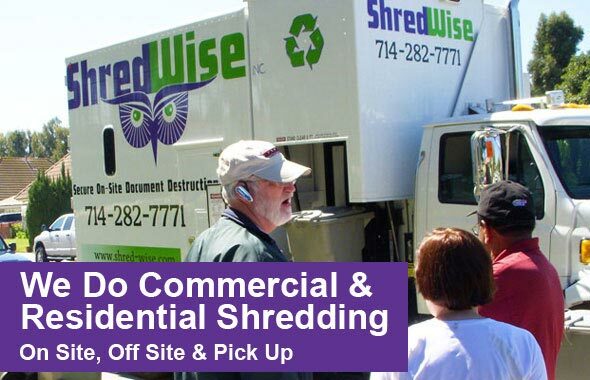 At Shred Wise Inc. we know that shredding services in Brea are just as important to our residential clients as they are to our commercial clients. Both types of clients deal with a surprising amount of data (tax documents, financial records, mail, junk mail, bank receipts, checks, confidential files, etc.) that, if stolen, can be used to cause substantial harm. In fact, did you know that any documents with just two pieces of personal information, such as a name and address or a name and ID number, should be shredded? To help our residential clients, we do our best to make our Brea shredding services not only accessible, but also affordable. With as few as seven or eight boxes of paper, our mobile shredding services can become as cost effective as taking them to a shredding facility. Plus, once you’ve collected that much paper to shred, you’ll avoid the time and hassle of doing it yourself. Moreover, your documents will be completely destroyed and diluted with hundreds of pounds of paper from other clients and then recycled, making it virtually impossible for someone to piece them together. To learn more about our residential shredding services in Brea, call today. Our off-site shredding services in Brea are a great option for businesses as well as individuals that wish to have a large amount of sensitive documents destroyed all at once. This service involves sending out a panel truck with a locked rear door to safely transport your boxes or bins of paper from your business or home to our facility in Orange, California. As soon as we return to our facility, we proceed with shredding your documents and then issue a Certificate of Destruction as soon as everything is destroyed. If you wish, your representative can witness the destruction of your documents. Call today to learn more or to schedule off-site shredding services in Brea. On-site (or mobile) shredding is the service most frequently requested by our Brea customers. This shredding service involves us driving one of our secure shredding trucks out to our clients, picking up their documents, loading them curbside into the truck, and immediately shredding them on site. Clients are welcome to watch the destruction process in person and can even view the shredder using our onboard “shred cam”. Once we are done, we provide a Certificate of Destruction, and then transport all shredded paper to a secure recycling facility where the paper is used to make new paper products. With every on-site/mobile shredding job in Brea, we guarantee that all paper documents will be 100% destroyed and 100% recycled. Our on-site shredding service is not only convenient, but also compliant with current privacy laws and highly affordable. Call today for a free quote. Shred Wise Inc. frequently handles requests for businesses and individuals in Brea who need to purge documents and files on an as-needed basis. For businesses, this is usually part of an annual purging process as part of their records retention schedule. For individuals, this usually happens when they are looking to declutter their home, cleaning out their garage, or clearing out a loved one’s home after their death. Just give us a call and we’ll schedule on-site or off-site shredding services in Brea for you. To make things easy without compromising the security of your documents, we provide you with locked shred bins for you to fill, and don’t require you to remove staples, paper clips, rubber bands, or file folders (except for hanging files with metal bars) from your piles of paper. Our uniformed employee can then shred your paper curbside while you watch, or load your filled bins onto a secure truck to be shredded at our facility. In both scenarios, you are invited to watch the destruction process and receive a Certification of Destruction when all of the documents have been destroyed. Call today to schedule a one-time purge of your documents and files in Brea. Whether you have a small two-person business or a multisite corporation, you likely are producing enough paper to justify regularly scheduled document destruction services. That’s because, no matter your industry, everything from employee records to billing statements should be shredded to keep you in line with today’s privacy legislation, and anything from personalized junk mail to tax records should be shredded to protect your business from fraud, data breaches, and identity theft. 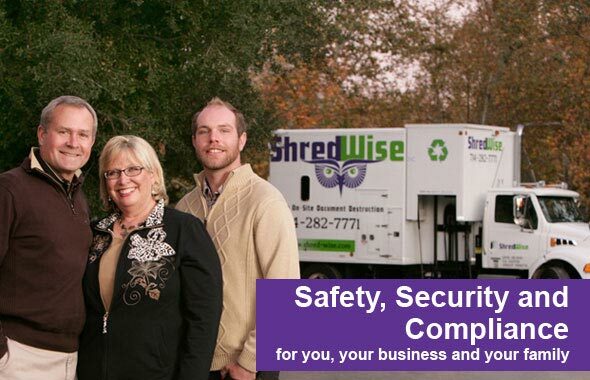 At Shred Wise Inc., we offer businesses in Brea reliable, flexible, and competitively priced mobile shredding services that comply with today’s strict privacy laws. Investing in a regularly scheduled document destruction service in Brea makes it easy for you to manage confidential information, and is much safer and cost-effective than having an employee shred your documents in-house. We can come to your place of business weekly, biweekly, monthly, or bimonthly, and also accommodate additional, last-minute requests for one-time purges. There are no long-term contracts and no hidden fees. Call today to learn more. 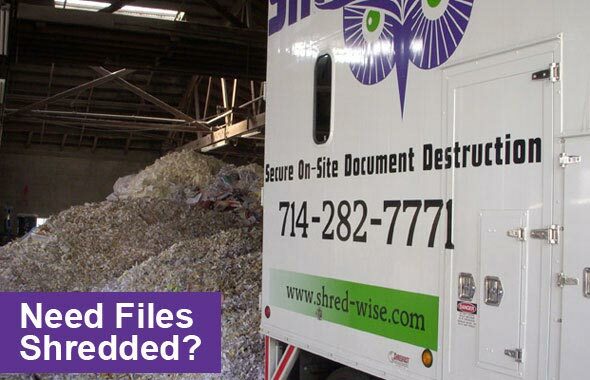 For all of your data destruction needs in Brea, call Shred Wise Inc.. We are a licensed and insured paper shredding company with an excellent reputation throughout Orange County for delivering superior service at a fair price. We are NAID-compliant and follow their recommended best practices for document destruction. In addition to paper documents and files, we can also destroy cds, dvds, hard drives, and more (basically any media except for those with tape). Call today for a free estimate over the phone or an on-site consultation in Brea. We are located at 3222 E. Chapman Avenue, Orange, California, and welcome calls or visits between 7am and 5:30pm, Monday through Saturday, and between 8am and 12pm on Sundays.